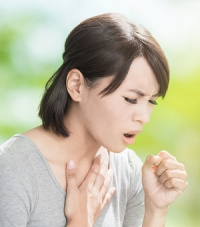 The most common causes of a chronic cough are smoking, post nasal drip, asthma and acid reflux. Other culprits are chronic bronchitis, the flu, pneumonia, whooping cough and certain blood pressure medications. Although less likely, lung cancer or cystic fibrosis can cause a chronic cough as well. In the simple and eloquent terms of acupuncture and Oriental Medicine, descriptions of energetic forces in the body take on human-like qualities. For example, uncontrollable coughing represents a risky, potentially dangerous characteristic known as ‘rebellious Qi.’ Qi is the most fundamental energy essential for all forms of life. Just as it sounds, rebellious Qi flows in the wrong direction and causes health problems. Certain acupuncture points will correct this Qi imbalance and redirect the Qi toward its correct, downward motion. An acupuncture point called Chest Center, located on the midline of the upper chest, greatly impacts the direction of rebellious Lung Qi. After careful insertion of a needle here, Lung Qi stops rising and reverses its course. This reduces or eliminates coughing. A practitioner of acupuncture and Oriental Medicine needs to help a patient eliminate risk factors that can contribute to a chronic cough. For example, smoking tobacco is one of the biggest risk factors, and stopping this habit is a necessity. Applying an ear needle protocol for chemical dependencies helps reduce a patient’s craving for tobacco, and assists the body in detoxifying harmful substances. In the case of acid reflux, a painful condition that feels like intense heat rising in the throat, acupuncture treatments can help the stomach from forcing digestive juices upwards. After eating, food enters the stomach where it churns with acids and then makes a downward progression. Rebellious stomach Qi prevents this descent, and acupuncture treatments will therefore focus on subduing this energy. As the acid reflux subsides, chronic coughing should lessen as well. Take the juice of one lemon and one lime and mix together with a teaspoon of honey. The honey will coat your throat and can help prevent or lessen coughing in the near future. The citrus juices help moisten your throat and soothe the raw sensations. You certainly don’t have to wait two months before treating a chronic cough with acupuncture and Oriental medicine. Getting help early can improve your quality of life and address any root causes of chronic cough. Next post: Want Relief from Headaches?